My maternal grandfather, Duncan MacLeod — I call him Papa — once told me we were kicked off the Isle of Skye for stealing sheep. He told me this early in our talks about the family history a few years back, which weren’t really talks as much as they were storytelling sessions, an important part of our culture. I sat in rapt attention as he told me stories of his youth and his family — our family. I’m not sure if the story about our sheep-stealing ancestor is true. In fact, it turns out Papa was wrong about a few details of our family’s past, and there were plenty of details he never knew at all. Still, his stories form the backbone of what I know about the MacLeods. The rest — things that happened before he was born — I discovered through my own research, and the research of others. It was through this research that I learned of the story of the MacLeods who came before us, the ones who endured hardship and worked to build new lives in other lands. The historical record of Clan MacLeod goes way back, but the trail of my MacLeod ancestors only goes as far back as 16 April 1746. On that fateful day, two armies met on Culloden moor near Inverness, Scotland: the supporters of Charles Edward Stuart (also known as Bonnie Prince Charlie) on one side, and a force led by William Augustus, Duke of Cumberland, on the other. The supporters of Bonnie Prince Charlie were fighting to remove the House of Hanover from the British throne and restore the House of Stuart. Known as Jacobites, the prince’s supporters had marched into England but stopped short of London to go back to Scotland to strengthen their ranks, and to wait for ships to arrive from France in support of their cause. The Jacobites were mostly Gaelic-speaking Roman Catholic Highlanders. Some clans, notably the MacDonalds, came out in force to fight for Charles. The chiefs of some other clans, however, would not commit their men. Clan MacLeod was one of those, but the chief decided he wouldn’t stop his clansmen from going off to support the Jacobite cause if they wished to do so on their own. And so a young Highlander named Duncan MacLeod stood among the troops on Culloden Moor that morning. He was my great-great-great-great-great-grandfather, and the man whose name would eventually make its way down through the generations to my grandfather and beyond. 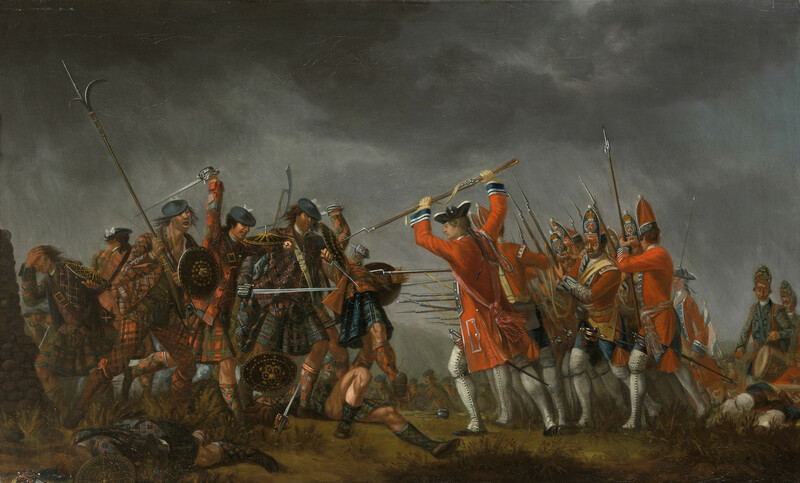 Battle of Culloden (1746), a painting by David Morier (taken from Wikipedia). The Battle of Culloden did not go well for the Jacobites. To make a long story short: They lost. The ships from France never came, the Jacobite army was routed, and Bonnie Prince Charlie escaped to live out the rest of his life in Rome. The Duke of Cumberland, who would later earn the nickname ‘Butcher’, ordered Jacobites who were found injured on the battlefield to be killed on the spot. Duncan MacLeod was said to have been among the wounded, but somehow he escaped and probably fled towards Inverness with other surviving Highlanders and continued to Fort Augustus. It was there that on 18 April the Jacobite army was disbanded and the remaining soldiers dispersed, with some fleeing the country and others attempting to resume their lives at home. After Culloden- Rebel Hunting, an 1884 painting by John Seymour Lucas (taken from Wikipedia). Malcolm, another son of Duncan ‘Swan’, moved to Garrick (near Glasgow) and was married to a woman from the Isle of Mull. I’ve read that some of Malcolm MacLeod’s descendants left Scotland and settled in Ontario. Duncan and Catherine also had three daughters that I know of: Mary, Effy and Ann. Unfortunately I don’t have information about whether they married or had children. I’m sure there are interesting stories in there somewhere. Donald was the only one of Duncan MacLeod’s sons to settle on Cape Breton Island, my home. However, it was not Donald who would pass on genes that eventually led to me and beyond. Instead, it was his brother John, who married a woman named Effie and died on Eigg. Chronicles of Duncan MacLeod is a series of posts on my MacLeod ancestors, based on a combination of research and stories told to me by my grandfather, Duncan MacLeod. To read other posts in the series, click here.